Don't worry, we will get onto the wonderfully charming properties complete with original exposed beams and farmhouse kitchens in just a sec. But if you are after a project and looking to renovate a barn for yourself, this property is a gem. The existing property has outline planning permission and can be converted into a pretty spacious two bedroom property. There are also four outbuildings that have the potential to be converted into studies/garages/games rooms/spare bedrooms/whatever you need room for. See, here's all that charm you were probably after. This two bedroom barn conversion has been sympathetically restored to create a spacious home, complete with a brand new bespoke fitted kitchen and luxury bathroom. The surrounding gardens have been beautifully landscaped and there are plenty of communal outdoor areas to chill in. This property is everything you would want in a barn conversion, all the charm none of the... farm? If vaulted ceilings are your thing, you are going to love this property. The front door opens onto the most glorious hallway/dining area, with massive floor to ceiling windows that overlook the garden and countryside beyond. There's a mezzanine landing above, so you get a lovely open plan feel. As well as the gorgeous features you'd expect in a barn conversion (including the original barn door), there is also a gym and a sauna. Set amidst rolling hills and beautiful countryside, this barn conversion couldn't get more idyllic. The interior is as charming as you would expect from just looking at it: beams galore, original windows, hardwood floors, farmhouse style kitchen, but the outside space is the real gem. A stone walled garden with well stocked borders, a rockery and a pond, two stone flagged seating areas and glorious views of the surrounding countryside. Can someone please invite us over for a G&T on the sun filled patio? Thanks. 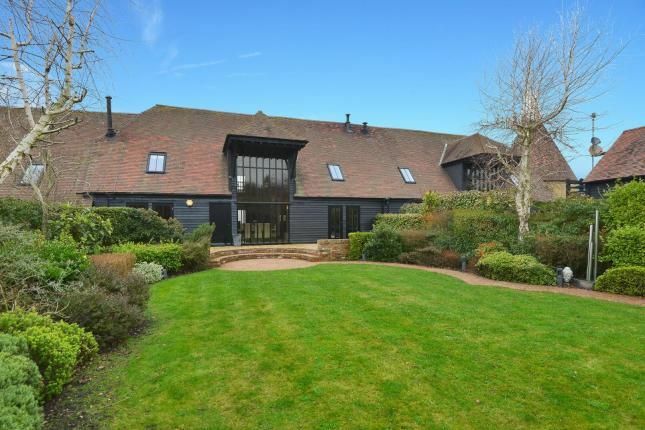 Okay, we have cheated a bit here, this property is actually a house and barn conversion combined. A glass bridge connects the main house to the barn, where there is a large family room, with doors that open out onto a large patio, a gorgeous light filled garden room, plus one of the five bedrooms and a study. There is definitely an opportunity for a holiday let here, if you are wanting to invest in a property that could make you some £££s.